The Road: Begins at the South Carolina State line at Tabor City (Columbus County) and ends at US 301/NC 96 near Four Oaks (Johnston County). History: US 701 was born in 1932 running more or less as it does now, as an addition to NC 23. 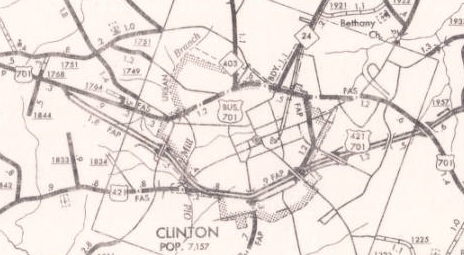 In 1947 or 1948, US 701 received an eastern bypass of Clinton using newly constructed Southeast and Northeast Blvd. The old route through Clinton using Southwest Blvd, Lisbon St, College St, and Beaman St became US 701-A (all secondary today). 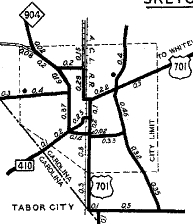 About 1953, US 701 was rerouted at Tabor City from using NC 410 into SC to using today's US 701 Business (replacing a bit of NC 904) into SC. About 1956, US 701 received its bypass of Whiteville. Both officials and county maps show the old route through town was secondary after that but today it is US 701 Business. 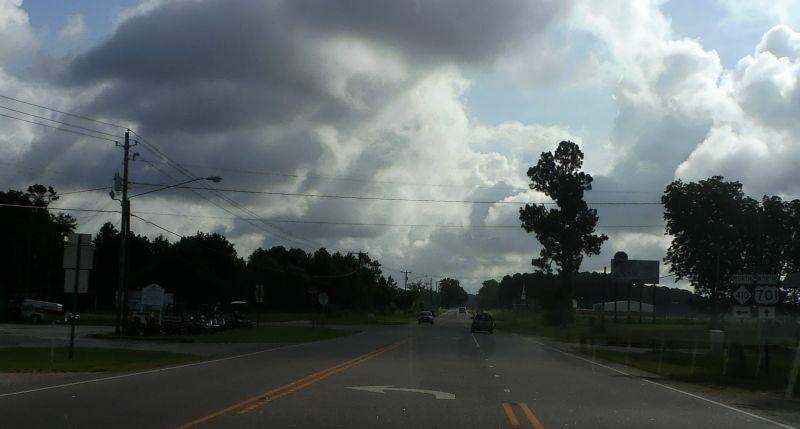 Between 1954-57, US 701 was removed from SR 1517 Barnes Loop Rd, SR 1518 (since abandoned), and SR 1523 Beards Chapel Loop Rd in northern Bladen County. 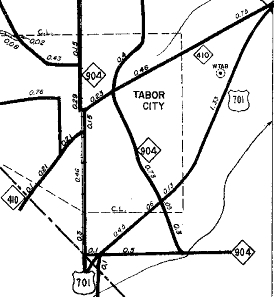 About 1957, US 701 received its bypass of Tabor City. Both officials and county maps show the old route through town was secondary after that but today it is US 701 Business. 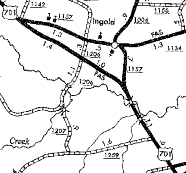 Also about 1957, US 701 received its bypass of Clarkton. 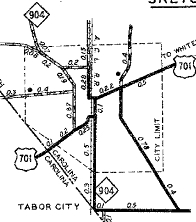 This was not shown on officials and the 1957 Bladen County map shows the old route as unnumbered but today it is US 701 Business. 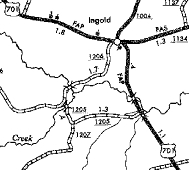 About 1965, US 701 was given its bypass of Ingold, leaving behind SR 1157 Old US 701. 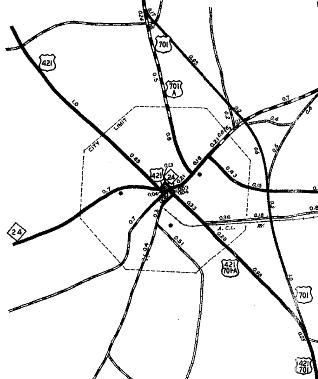 In March 1973 (NCDOT), US 701 was placed on US 421's western bypass of Clinton plus newly constructed freeway northeast to connect back to US 701. Southeeast and Northeast Blvds. became US 701 Business. Comments: US 701 is a pretty quiet route for the most part, though it can be used as a back way to the beaches of South Carolina's Grand Strand. Interestingly, there is a sign for Raliegh on US 701 at SC 9 Business in Loris, SC. The NC 96 multiplex on US 701's northern end did not exist prior to I-95's completion.